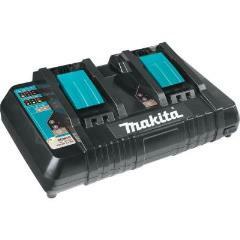 Makita DC18RD Dual Port Charger - Available Now! The Makita DC18RD dual port charger is capable of charging two Makita 18V batteries at the same time. The charging time is the same as the single port charger DC18RC. Also features a USB Port for charging mobile phone, tablets, etc. This USB port provides 15A output. A built-in CPU - gathers information from the battery's memory chip to determine optimum charging methods while a forced air cooling fan cools the battery to minimise charging time. With an audible sound alert to indicate full charge and an LED Charging Display.